IEDD is short for Improvised Explosive Device Disposal. 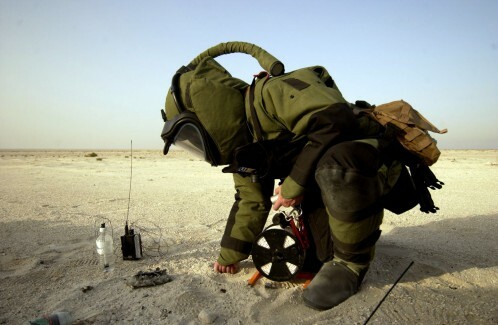 Often interchangeable with Explosive Ordnance Disposal (EOD), Bomb squad, and Public Safety Bomb Disposal (PSBD), IEDD has been around since the beginning of modern military conflict. The primary focus of IEDD used to be mines and unexploded bombs (UXBs) but has evolved into more of an anti-terror procedure as “traditional combat” becomes less and less prevalent in modern conflict. Today, Improvised Explosive Devices (IED) can be created with such sophistication that they can be triggered by infra-red switches or even cell phone signals. Countries around the globe spend significant amounts of money investing in Counter-IED technology. RVI tools, Electronic Countermeasures, Robots, Solider-Worn Protection, and Armored/Mine-Resistant vehicles are just a few of the most common Counter-IED methods.